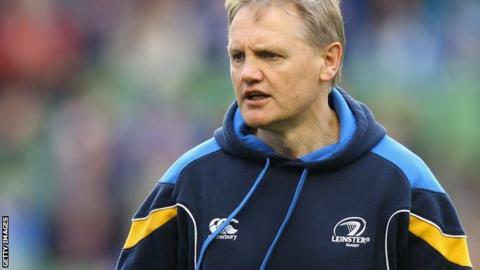 Wales should consider following Ireland's model of allowing the home Union to control the best players, says Leinster coach Joe Schmidt. Ireland's Test players are contracted to the Irish Rugby Football Union and represent one of the four provinces. The Welsh Rugby Union want to implement a similar model instead of having the players employed by the four regions. "In the main it works here," said Schmidt. "That's something for Wales to think about and get some solutions." Schmidt's comments came after his Leinster side won 33-14 against Scarlets in the Heineken Cup, consigning the Welsh region to their fifth successive defeat this season. No Welsh region will be in this season's quarter-finals, while three of Ireland's four representatives in the competition - Leinster, Munster and Ulster - are in contention for the last eight. Wales' woeful record, together with the continuing financial problems and loss of high-profile players to France, has prompted calls for a change to the structure of the professional game. Ireland's model of contracting the elite players to the IRFU has already been suggested as the most suitable one for Wales to copy, but the Welsh regions are reluctant to relinquish control. Schmidt says the structure allows Ireland to protect their players from playing too frequently, ensures the best Irish players stay with Irish provinces and helps to accelerate the development of young players. "I think the IRFU's mantra to keep quality players on the island is really positive for the provinces," said New Zealander Schmidt, pointing to the fact he has only four non-Irish players on his books. "I think that's also something that has profit for the Irish national team. In the autumn Test period, I've no doubt that some of the Welsh players were a little bit tired having played in the Top 14 [in France]. "It's pretty attritional, the Top 14, and you don't have the opportunity to put a player management programme in place when players are playing offshore." The drawback for Leinster, conceded Schmidt, is the loss of control over certain players when the national side want them to be rested. His side were "dismembered" on the opening day of the season when his inexperienced side, shorn of 11 internationals, lost 45-20 at Scarlets in a Pro12 match. "We've used over 50 players this season," added Schmidt, a two-time Heineken Cup winner with Leinster. "That's not always conducive to continuity or even consistent performance but it's really conducive to development and progression for younger players." Although Ireland have failed to match Wales' success on the international stage - winning one Six Nations Grand Slam to Wales' three in recent seasons - the Irish provinces have thrived in Europe. Leinster have won the last two Heineken Cups, and an Irish province has conquered Europe in four of the last five seasons. A Welsh region has never been crowed champions of Europe, and 2009 was the last time one of them reached the semi-finals. WRU chief executive Roger Lewis believes centralising budgets, marketing, staffing and player recruitment will lead to an improvement in Europe but the four Welsh regions want more funding from the Union and to continue to control the players. Schmidt added: "It's about making sure that we're growing our own players, developing them and that our academies are strong. "All those things are happening as effectively as they can be. That's something IRFU is good at supporting as well. That investment is a real positive for us."